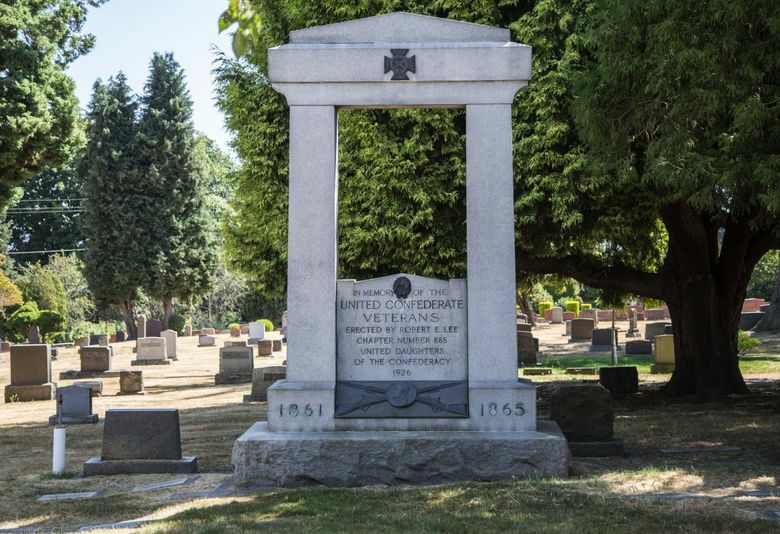 On a sleepy, urban hilltop in Seattle stands a monument to Confederate soldiers. It's been there for more than 90 years. In a cemetery that’s best known as the final resting place for martial artist Bruce Lee and his son Brandon, as well as Seattle’s founders (think Denny and Dexter), lies a 10-ton slab of Georgia granite, inscribed as a monument to the Confederacy. 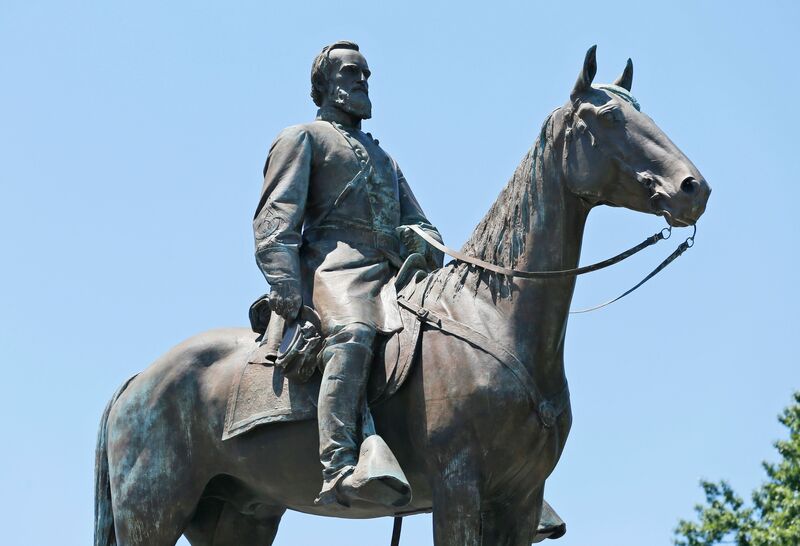 During a time in our country when similar markers and statues are being torn down or removed from public lands, even sparking violent confrontations, like on Saturday in Charlottesville, Virginia, Seattle’s own monument to the rebel South can be found in a sleepy Capitol Hill cemetery — if you look hard enough. The doorway-like structure, made of two stone columns and topped by a pediment, was erected in 1926 in what is now known as Lake View Cemetery, located just north of Volunteer Park and just to the south of the Grand Army of the Republic Cemetery, where Civil War veterans are buried. A news clipping talks about the construction and installation of the granite Confederate monument, put up in Seattle’s Lakeview Cemetery in 1926 by the United Daughters of the Confederacy. The words sit above a pair of crossed muskets and an oval, metal relief of Gen. Lee’s profile. Kevin Healy, who has cared for the cemetery grounds for 40 years, was initially hesitant to talk about the monument on Tuesday. It’s been defaced twice. “We try to keep it low profile,” he said. Healy thinks it’s much more interesting to talk about Bruce Lee, the legendary martial-arts figure and movie star, and his son Brandon, who are “by far” the cemetery’s most popular draws. Or all the famous city founders buried here with names you might recognize from street signs: Denny, Blaine, Phinney, Horton, Dexter and Colman. He’d even rather talk about his job. “I say, ‘I work in a park with animals, trees, plants, Mother Nature, and I happen to bury the dead,’ ” Healy said, adding that he’s buried people of all ages and races and religions who died in all sorts of ways. Looking for a final resting spot? Healy said there’s still plenty of room for bodies in the urban cemetery, though prices for hilltop sites are more expensive than those at the bottom near the fence. “But that’s just life,” he said. Healy said he understands why someone might be tolerant of the Confederate monument, which was intended to honor the veterans who fought in the war.